If you follow me on either Instagram, Twitter, FourSquare or Facebook (of course you do! ), then you’ve noticed my many checked ins and pictures of our great eats at Roger’s Diner, located on C-Ring, between AlSadd and AlRayyan Road in Doha. My co-workers and I loved the business lunch deal, where you get an appetizer, entree and dessert for only 55QR from 12-3pm. So when Roger’s Diner invited me along with 3 friends to taste test the new menu on the evening of January 11th, I couldn’t say “no”! My co-workers Sahar and Adel were excited about the invitation and to be able to introduce this amazing place to our friend Dana and our new colleague, Ahmed, whom just landed in Qatar a few months ago. Roger’s was kind enough to stretch our invitation an extra seat so that our two newbies can taste why Roger’s is one of our favorite lunch spots. From Left to Right: Ahmed, Ms. Hala, Sahar, Dana and Adel. The entire restaurant was reserved for just the invitees of the new menu taste testers that evening. It made me feel very VIP if you ask me. It surely impressed our group as we walked in, welcomed and our verbal note of an invitation honored. 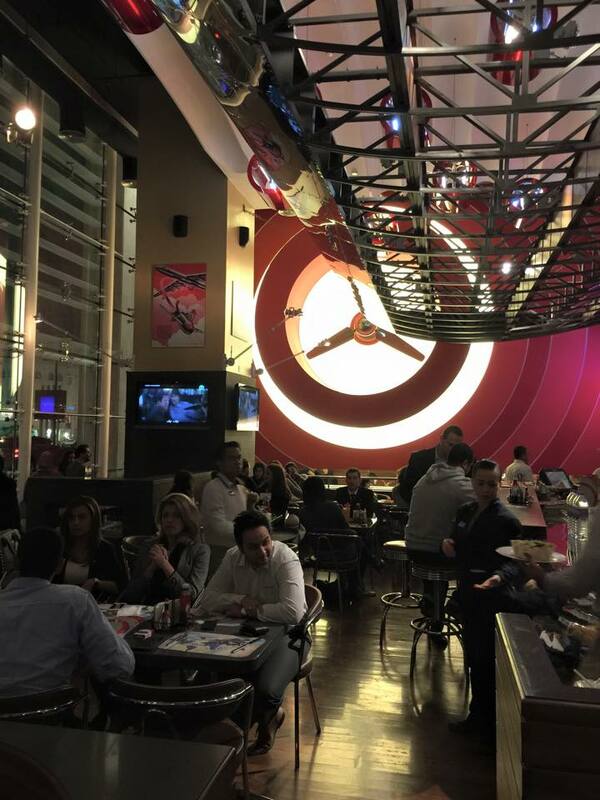 Roger’s maintains a classic American aviation theme with a large plane propeller and a wide flight wings as decor. From the cushioned booths to the table settings to the menu design, the theme is through out while maintaining the look and feel of a legit American diner. Large TVs are propped throughout the restaurant usually planing an American movie or a soccer (keeping it American) game with popular American 90s music playing in the background. In all honesty, I always feel like I’m in a diner back home in the States on any given day. Roger’s previous menu was fairly simply, give or take 5 different kinds of appetizers, salads, sandwiches, hamburgers, pastas and desserts. This new menu has much more options plus the originals still intact which I was so glad to see. It only made sense for us to order as we usually do: an appetizer, entree and dessert. After asking our hosts what they recommended we try off the new menu, we made our order. It was great to see our hosts be well aware of the new menu and their excitement over the new dishes they’ve surely tried and enjoyed. I took a glance at the prices which seemed to be along the lines of the previous menu. Most dishes ranging from 20 to 70QR. The drinks remained the same though I had hoped for bigger glasses versus those two-sips-your-done they keep serving iced tea in for 24QR. At least offer refills for ice tea and fountain drinks for those cups, please. Pretty please! We were all very pleased with our appetizers. Sahar, Dana and myself ordered varying soups and were very please with the taste, texture and portion. 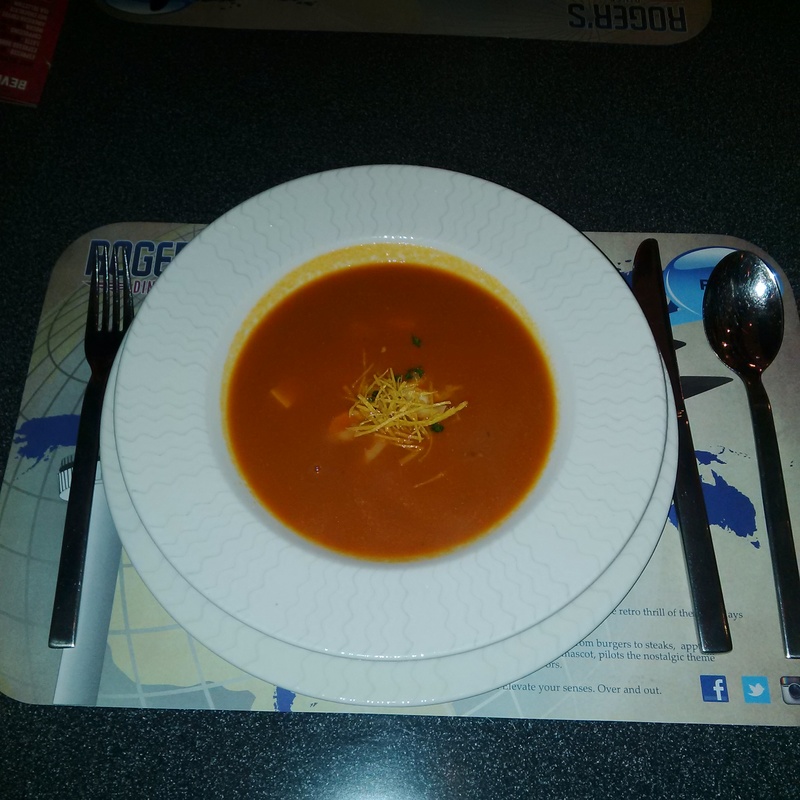 I could have easily been happy with a soup and salad combo, an option I’d like Roger’s to offer at a decent price. Ahmed ordered a mixed fried appetizer dish which was pretty good, ranging from onion rings to calimari. The portion was large and easily shared amongst all 5 of us. 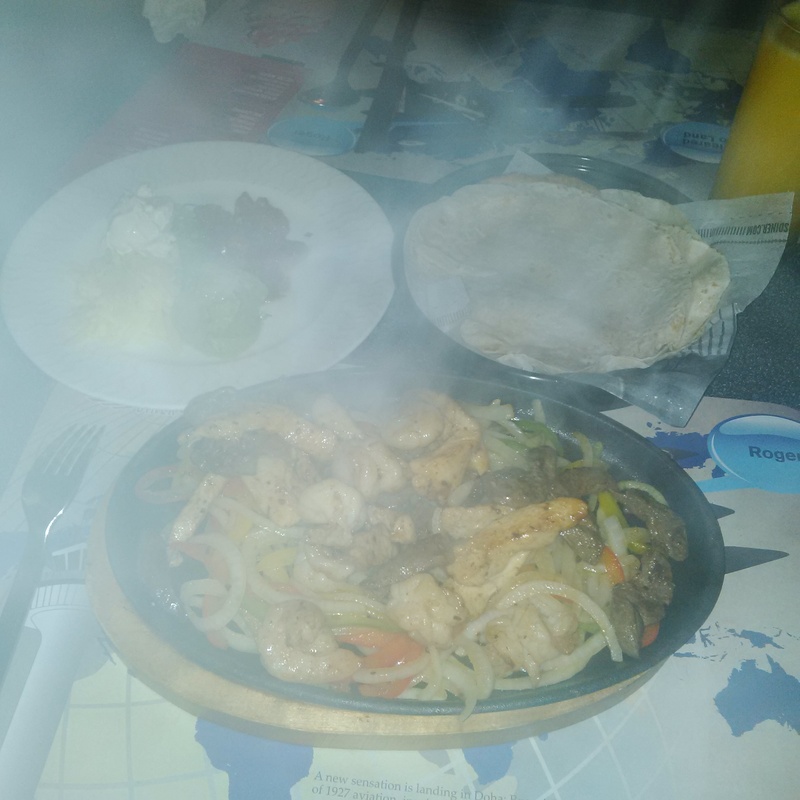 For our entrees, two of us ordered the new sizzling fajitas, and I mean sizzling! I ordered the mixed chicken and shrimp while Ahmed ordered the beef. My dish was very tender, flavorful and the side toppings were more than enough. However, I wish the server hadn’t uncovered my tortilla bin as they cooled down fairly quickly during the 10 or so minutes we were asked to pose for pictures. 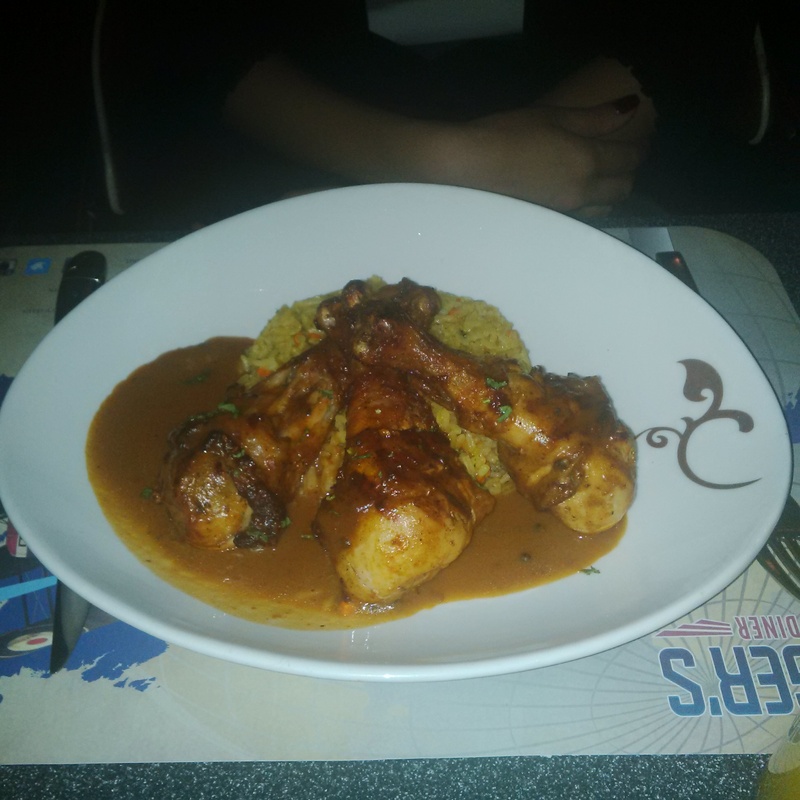 Sahar ordered the seasoned chicken drumsticks with rice and gravy. The portion was large and very filling according to her. A dish she would order again. Adel ordered the salmon and raved at it’s flavor. It took a while longer than the rest of our dishes to come out but he was extremely happy with his dish that my camera missed it. 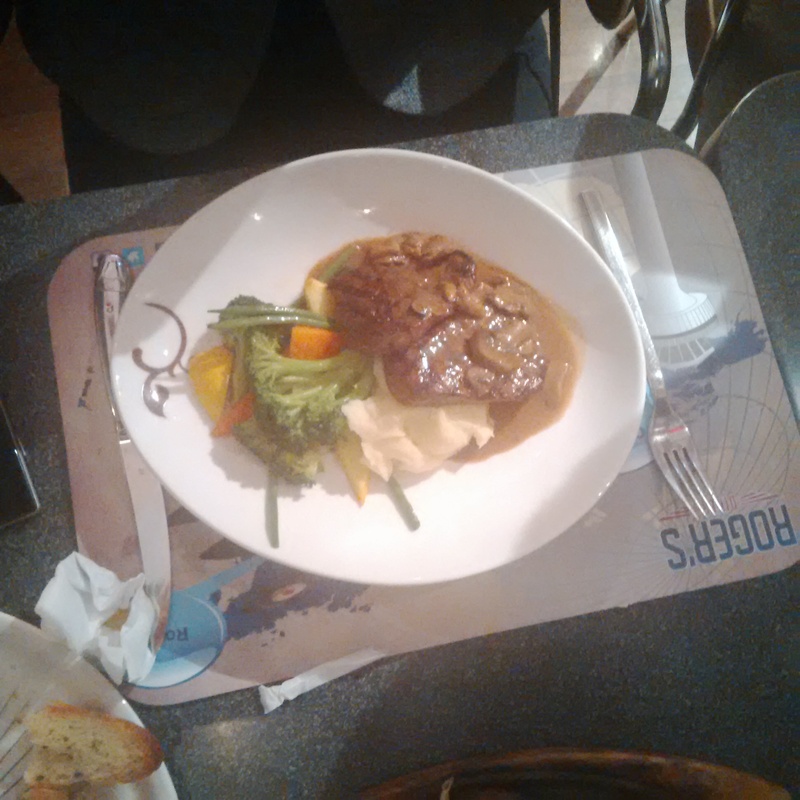 Dana ordered the beef medallions with steamed vegetables topped with mushroom sauce. She stated it was tender, juicy and cooked to her liking. A dish she recommended we must try on our next visit. For dessert, I ordered the Nutella banana crepe, Sahar ordered the Oreo fundant cake and the rest ordered the classic New York cheese cake. I was not happy with my dessert at all. The crepe itself was very doughy, the Nutella not enough spared that I didn’t finish it. Sahar thought her cake was OK, disappointed that the melted chocolate center that was expected was really just Oreo cookie crumbs. We both thought that something needs to be added to make this Oreo cake sublime. 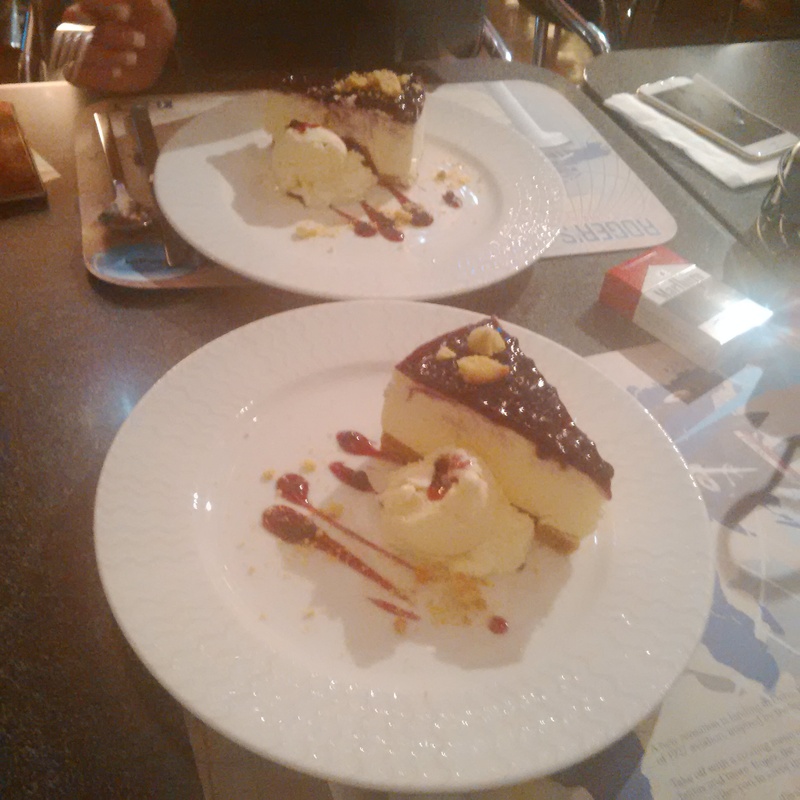 The rest were very happy with the cheese cakes, a dessert off the classic menu. I’ve always enjoyed the brownie a la mode and recommend it to anyone on any given day. 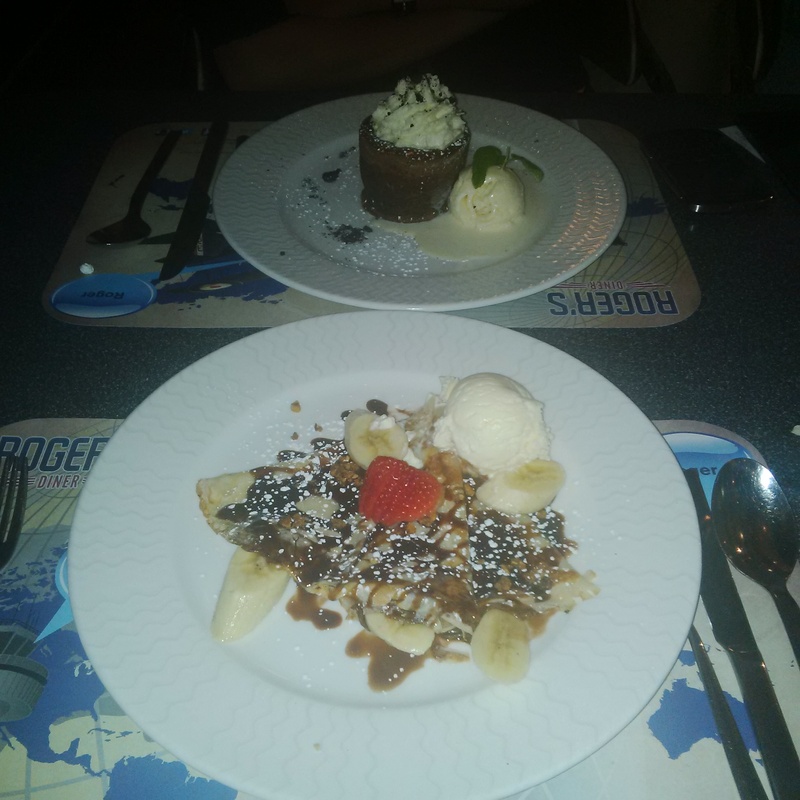 It’s always been my favorite dessert at Roger’s and a part of me wish I had ordered it instead. Our group had a fantastic evening and truly enjoyed our food! I really hope Roger’s fixes up those dessert recipes as it does have a lot of potential. The ambiance was friendly as always and the service was seriously at it’s best! A special shout out to our waiter Paul, whom really went over and beyond to accommodate us that evening. We’d like to once again thank Qanect and Roger’s Diner for a lovely evening, a great new menu and the overall wonderful food! It was a delight to taste test the new offerings and can’t wait until the business lunches are rebooted! 2015 is the year I shall begin writing a few reviews a month since I’m constantly raving about the amazing eateries here in Qatar. In between reviews, I highly recommend that you check out some of my favorite Qatar based foodie bloggers, Hungry Birds Doha and Life on the Wedge… You’re welcome. Thank you for the shout out sweetie.